Being kidnapped and unexpectedly thrust into the paranormal world she didn’t even know existed has overwhelmed Tessera. Even more, because her savior is the President of the Death by Reaper MC, Vampire Charter, who claimed her as his eternal mate. Between protecting his mate from his own wrath and trying to balance his MC duties, Jagger is fighting a battle bigger than the fight between good and evil. Finding a solution for the stack of danger that keeps growing might involve teaming up with a new enemy who is reluctant to join forces. With a threat of an apocalypse in the near future, there is no option other than to surrender to the truth more paranormal lives are needed to keep the rest of the world living. Evil hides in the inevitable to rectify redemption. 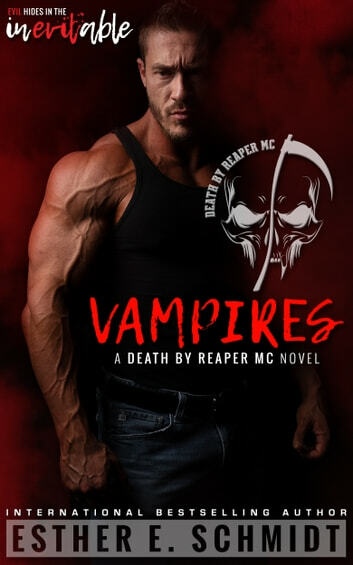 Dive into book two of Death by Reaper MC and submit to the reality crawling into the darkness might be the only good this world has to offer. Wow this author just completely took my breath away! It's like living in the world of Good and Evil, right and wrong, with a dose of Heaven and h311. Angels and demons beware! The Death by Reaper MC is back and bigger than ever. If you enjoyed book one then you won't be disappointed with this new addition. The new and old characters with a dash of mates will make diving into this novel a breeze. I can't wait to see what the author comes up with next!